Peal vs. Peel: What’s the Difference? Home » Peal vs. Peel: What’s the Difference? Words that are pronounced the same but do not mean the same thing are called homophones. Peel and peal are homophones, and many writers mix them up on the page, which leads to confusion for readers. Continue reading to learn whether you should choose peal or peel in your writing, and why. What is the Difference Between Peal and Peel? In this article, I will compare peel vs peal. I will use each word in a sentence and explain its proper context. Plus, I will reveal a mnemonic that you can use to help you choose whether peel or peal is correct, based on context. What does peal mean? Peal can be a noun or a verb. As a noun, peal means a loud, ringing noise. As a verb, peal means to emit such a noise. The church bells peal every hour, on the hour. Thunder pealed, and the rain came pouring down. A peal of thunder reverberated over the beach. When Bryan farted while singing “Happy Birthday,” Angela burst into peals of laughter. What does peel mean? Peel can also be a noun or a verb. As a noun, peel refers to the outer skin of a fruit or vegetable or a section of this outer skin that has been removed. As a verb, peel means to remove the outer layer of something in small strips. Johanna threw her banana peel on the ground, and Marco stepped on it. There were paint peels in the puddle in front of the garage. Peel three oranges and put them in the blender. The paint will peel off the walls before John finishes his boring speech. Just as it’s important to use these two words correctly when they stand alone in your writing, it’s also important to use them correctly when they are a part of a larger phrase. Here are a few of the most common phrases that use peal and peal and how they should appear. Keep your eyes peeled: keep your eye out, watch carefully, be on the look out for. To peel out: to leave quickly, especially in a car; to accelerate from a stop so quickly that the tires of a car squeal and smoke. He peeled out when he left the parking garage. Chemical peel: a technique used to improve and smooth texture of skin, especially the face. After my pedicure, I got a chemical peel, and I feel great! Peals of thunder; Peals of laughter: a loud repeated or reverberating sound of thunder or laughter. 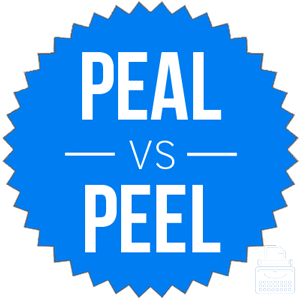 Here is a helpful trick to remember peel vs. peal. Both peal and peel can function as a noun or a verb. That being said, they are not interchangeable. Peel refers to the skin of a fruit or vegetable, or more generally, the outside layer of something and that layer’s removal. There is an easy way to remember when to use each of these words. Peal can refer to the musical sound of a bell, and contains the letter A. Since A also refers to a specific musical note, you will always know to use peal in contexts involving sound. Is it peal or peel? Homophones make life interesting for novice and veteran writers alike. Peel and peal, two homophones which can each be used as a noun or a verb, refer to different concepts and cannot be substituted for one another. Peal refers to the sound of a bell, or any other ringing sound. A peel is the outer rind of a fruit or any other layer, or the act of removing such a layer. You can remember to save peal for situations involving sound since peal contains an A, which is also a note of music. Next time writer’s block hits, be sure to check this site for help with confusing words and other writing topics. 1 What is the Difference Between Peal and Peel? Sulfur or Sulphur: What’s the Difference? Proscribe vs. Prescribe: What’s the Difference?